Where did I go? Not telling! You see, I found somewhere so quiet and peaceful that if the five people who read my blog were to go all at the same time, the place would become seriously crowded. I just looked through my collection of more than forty beach photographs and there is not a tourist visible on any of them. An occasional fisherman, and a dog or two, but no tourists. So, why should I let you spoil my private paradise? I was trolling through the AirAsia route map, when I spotted flights to some place called Surat Thani. There are flights only on Tuesdays and Saturdays, which is unusual for AirAsia, so I wondered where the heck this place is, and why anyone would want to go. It is roughly halfway between the Malaysia/Thai border and Bangkok. Not far north of Phuket and Krabi, but closer to the east coast. The first thing I figured is that it’s the nearest mainland airport to the popular Koh Samui, but since the latter has its own airport, I couldn’t figure why would anyone want to go via Surat Thani, and then have to take a bus and ferry. And I still don’t know, but from the chatter on the farang-filled flight, it seemed like that’s what everyone was doing, except me. I like to be different. When I looked at the flight schedule, one important thing I noticed was that the flight from KL was at the sensible time of 10:35am, not my usual choice of 7am or earlier. Then I discovered the flights Tuesday to Saturday were cheaper than Saturday to Tuesday, so it cost less to stay longer. You can probably guess which option I chose! The flight is a pleasant and short ninety minutes, so no need to pay for one of AirAsia’s meals. The first things I noticed on arrival were the size of the airport – small and efficient – and the oh-so clear air. In KL it was unpleasantly hazy with the visibility at perhaps 2kms, whereas in Surat Thani I could see mountains that were probably 100kms away. I have to say though I was lucky, because only a couple of weeks before my trip someone had set fire to the nearby hills, allegedly to clear them to create oil palm plantations, and for a while, the air had been smoke-filled and choking. Someone told me that in ten years time the whole area will be plantations. A shame, but we do like our margarine and cooking oil don’t we. Before deciding where to stay, I had several arguments with myself. It would have been very easy to head to a beach resort, stay put, relax, do nothing – but see nothing. In the end the more adventurous side of me won the day, and I planned a two-center vacation in order to see as much as possible. I figured if I liked the area, which I instinctively knew I would, I could be lazy on future trips, going to places I knew would be nice. One thing I quickly figured was, I would need a car. Surat Thani airport is some distance from Surat Thani city, and it didn’t need much research to figure there’s not a whole lot to see in Surat Thani anyways. (Make that “nothing to see.”) The attractions are the Khanom beach area, some 80kms beyond Surat, plus the ancient city of Nakhon Si Thammarat, 100kms further south. But there’s some good deals on rentals at the airport so picking up a car was quick, efficient and cheap. I was out of the airport within thirty minutes of landing. 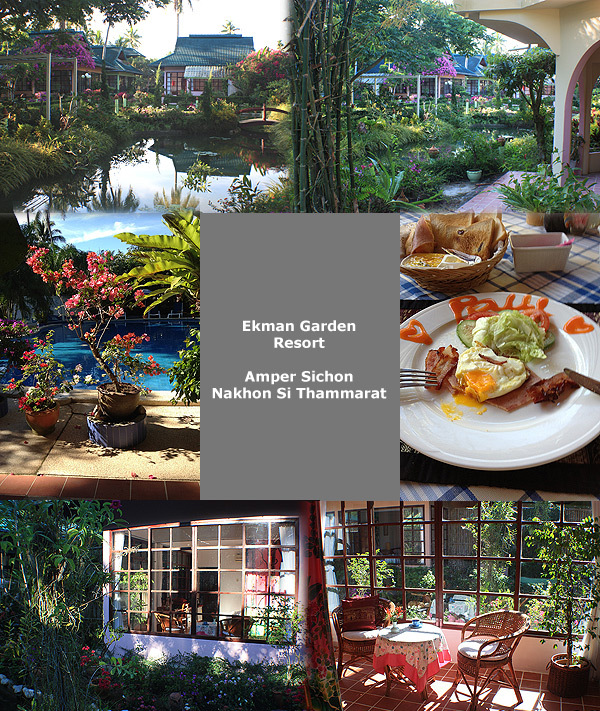 The place I chose to spend the first two nights was the Ekman Garden Resort. It’s roughly-speaking in the middle of nowhere, about 150kms from the airport. The roads are mostly four-lanes with minimal traffic, and the hotel is about 200 meters away from one of them, so I was there in an hour and half. The hotel is well-named because it’s owned by the Ekmans, and boy do they have a garden! Usually I’m not over-awed by flowers. I figure if you take the trouble to plant something, you should be able to eat it when it’s grown. But I have to admit, their garden is spectacular. The rooms are spacious and airy, with almost ceiling to floor sliding windows. Each room has a sitting area, plus a secluded outdoor section. In addition to the large garden, there is a pleasant swimming pool, bar and restaurant. Oh, and they have free WiFi. As the only guest there I received royal treatment from the Swedish/Thai owners Stefan and Anna. I spent my first afternoon exploring the surrounding area, finding totally deserted beaches just fifteen minutes away on foot, or a few minutes by car. I confess I drove there, but I did have a long walk on the beach, accompanied by an inquisitive dog. I tried to “woof” in Thai, but he didn’t seem impressed. It’s so nice to see kilometers of beach without a building or person in sight, something I think is very rare these days. I couldn’t help wondering of the developers would ever move in and ruin the place. One benefit of being the only guest was being asked “What would you like for your evening meal?” Anna suggested a Thai Red Curry, which I eagerly accepted and thoroughly enjoyed. This was washed down with … how shall I say? … an “adequate” quantity of Chang beer. Stefan joined me during the evening and we talked about more things than I can remember … although I do recall trying to teach him binary arithmetic, but I’ve no idea why. Must have been something to do with the beer. On my first full day, following a suitably personalized American breakfast (see pic. 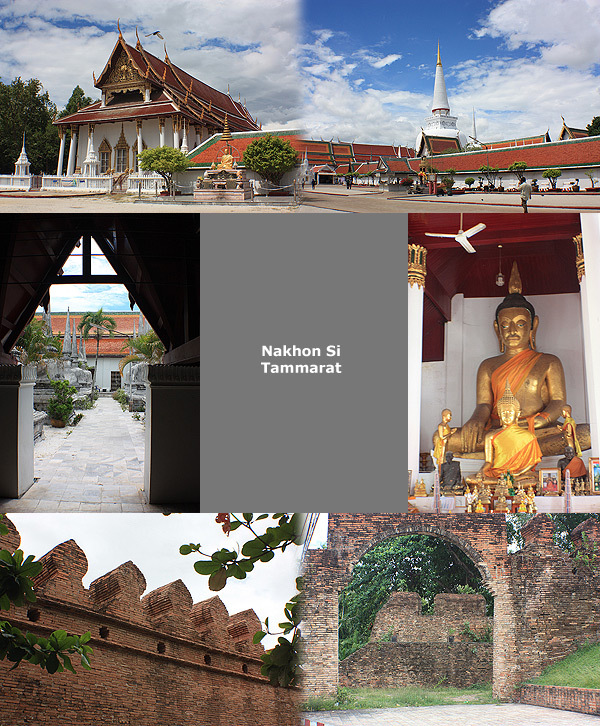 above) I headed about an hour south to Nakhon Si Tammarat. It’s not unlike Chiang Mai, but without the hordes of tourists. Large ancient Wat, and 800 year-old city walls. It’s famous for it’s wayang kulit puppet makers, but due to the lack of tourist signs, I never found any. To be honest, I should have left the car somewhere and walked around the city. Next time. With the rain now over the city, I headed up into the mountains where it seemed to be clear. I can’t say that I found any “must see” attractions, but the scenery is generally quite spectacular, so a couple of hours of driving was very rewarding. This just left enough time for another beach walk, and back to the hotel for another excellent supper. Leaving next day was tough. Anna and Stefan, plus the staff, made me feel very welcome, and for sure I will be back. Stay tuned for news of my my next two days in paradise.